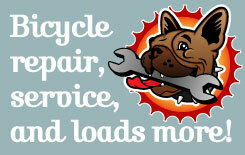 Recommended every 6-12 months for bikes that are in frequent use. Basic set-up service for bikes bought online. Also appropriate for machines that have been well maintained but not ridden for a while. We can supply accessories such as lights, computers and racks, which we will fit free of charge as part of any service package. *Please note we have a £15 minimum labour charge. We make no charge for callouts to postcodes TN1, TN2, TN3 & TN4, although we do have a minimum labour charge of £15. We’re happy to travel further afield but this may incur a small extra cost.